It finally dawned on me a few days ago why I’ve been so endlessly obsessed with Ricky Jay. It isn’t just the magic. It isn’t just the stage presence and banter. It’s his voice. Because, it turns out, he was the narrator for one of my favorite movies of all time, Magnolia. So he’s permanently imprinted in my brain as someone super-important. So here’s a little late night entertainment. 8:2, everyone…. As I’m writing this on Sunday around 7:30 pm ET, the four U.S. E-mini Futures indices have gapped up and are currently trading above a “chaos zone” of a trio of future-offset 5, 8 & 13 moving averages (green, red & blue), as shown on the following daily charts of the YM, ES, NQ and RTY. Both the YM and ES are above the 50 MA (pink) and 200 MA (yellow). Both the NQ and RTY are trading under the bearish influence of a moving average Death Cross formation. The NQ is slightly above its 50 MA, but slightly below the 200 MA, whereas the RTY is below both of those. 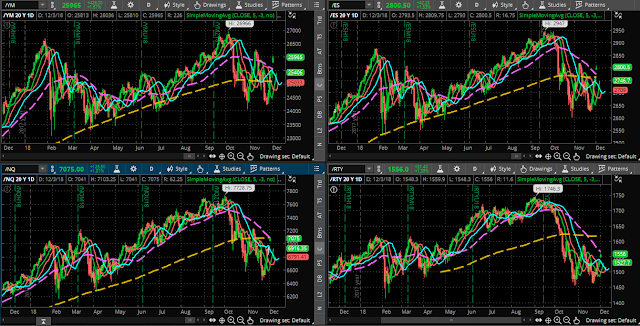 On a short-term basis, I’ll be looking for price on all four E-minis to hold above, firstly the moving average trio and, secondly, their 50 MA to maintain a bullish bias, whereby we may, potentially, see them retest their highs of this year or even set new records before year end (the RTY will have to first break above its 50 MA). One of my favorite Slopers shared with me a video I absolutely loved. I just finished listening to it in the background as I was entering in all my new trades. I encourage you to enjoy this informative and excellent conversation with a legendary investor.